Your Mac is assigned something called an IP address when it connects to a network. Other devices that are connected to the same network can use this unique identifier to transfer information to and from your Mac. If this sounds confusing, it might help to think of an IP address as your Mac's home mailing address. Just like physical mail, which is routed to your home via a unique address, digital information is routed to your Mac using an IP address. Select Network. 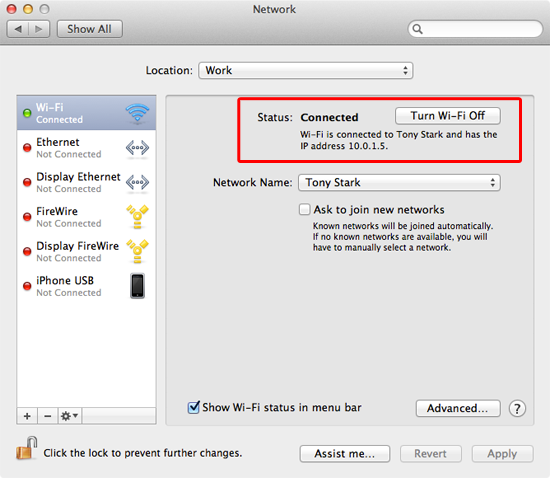 Your Mac's network preferences appear, as shown below. From the sidebar, select an active network interface. Note: Every active network interface is assigned a different IP address. For example, if your Mac is connected to an ethernet cable and a wireless network, there is an IP address assigned to each network interface. Your Mac's current IP address for the selected network interface is displayed in the Status section of the window, as shown above. Congratulations! 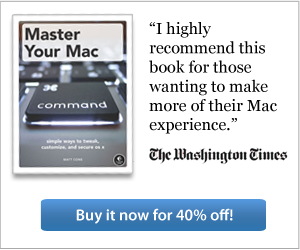 You have successfully found your Mac's IP address. There are two different types of IP addresses. Static IP addresses are permanent or semi-permanent addresses that can be accessed from virtually anywhere. These types of addresses are usually reserved for computers that need to be frequently accessed by other people. Most web servers, VPN servers, groupware servers, and network routing equipment like AirPort base stations have static IP addresses assigned. Dynamic IP addresses are temporary addresses that are unique only to your internal network, which is commonly referred to as an intranet. These addresses commonly start with 192.168 and 10.0.1. Since these addresses are dynamically and randomly assigned by the router every time a device connects to a network, you can't expect your Mac to have the same dynamic IP address every time you connect.